The Wall Street Journal has outlined its expectations for Apple's media event tomorrow at Steve Jobs Theater, where the company is expected to introduce subscription-based services for movies and TV shows, magazines and newspapers, and possibly games. The keynote begins Monday at 10 a.m. Pacific Time. As we've heard previously, the report claims Apple plans to unveil the first footage from some of its new original TV shows at the event. Hollywood stars such as actress Reese Witherspoon and director J.J. Abrams have been invited to attend. Apple's revamped TV app will make it easier to subscribe to networks such as Starz, Showtime and HBO, with which Apple has been "negotiating to offer their shows to users for $9.99 a month each." It's unclear if that means each network will cost $9.99 per month or if each user will pay $9.99 per month total. Apple is said to be negotiating to bring its new TV app to multiple platforms, including Roku and smart TVs. 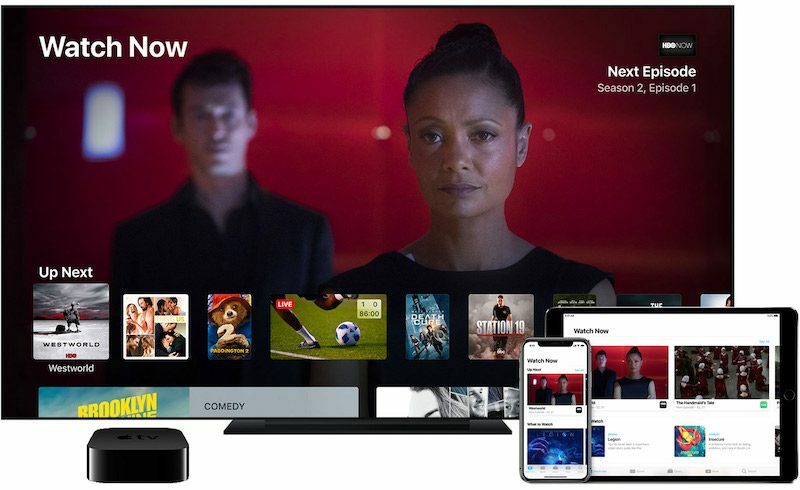 This could refer to an expansion of the new iTunes movies and TV shows app coming to Samsung's latest smart TVs to other leading TV brands such as Sony and LG and to cheaper brands such as TCL and Sharp via Roku. The revamped Apple News app is expected to be based on Texture, the magazine subscription service that Apple acquired last year. The report claims The Washington Post and The New York Times are not participating in the service at launch due to disagreements over Apple's alleged 50-50 revenue split. The report goes on to mention how Apple CEO Tim Cook began holding monthly meetings with Apple's services division around late 2017 as the company aims to grow its revenue from existing subscription offerings such as Apple Music and iCloud storage. Apple's video and news subscription offerings will certainly help the company expand its service portfolio further, but its exact plans are still clouded in secrecy. In less than 24 hours, we'll have a better understanding. None of the premium services have shows worth $10 a month - especially Starz. HBO has a great back catalog and many popular shows that are still airing. Maybe they just don't have shows you like. What does any of this crap have to do with tomorrow’s keynote? I guess I don't see why HBO wouldn't simultaneously offer HBOnow direct to people for $10 (down from $15) and keep 100% of it. Eddy Cue is now the most important and influential person at Apple and a cert to be the next CEO. Eddy Cue always walks on stage like he just teleported from a Las Vegas casino and is surprised to be where he is but rolls with it. I hope he's not the next CEO and they get someone more tech-minded. Maybe Scott Forstall will come back and save the company. If only it needed saving . . . they have too much money to appeal to the people they won over when Steve Jobs first came back. Apple was at its best when it was on the ropes. They had an infusion of amazing software by acquiring NeXT. Now I can't even get Disk Utility to work and I prefer pretty much every third party app compared to Apple's equivalent offering. I guess the question should rather be: What does tomorrow's event have to do with a company that used to be known for building professional computer equipment? Somewhere, something went terribly wrong in Cupertino. Soon, the Apple data centers will host a myriad of Windows PCs for their streaming service for games. The rest of the servers will be busy streaming video content to their consumption devices: AppleTV, iPad and iPhone. The Mac will only remain for the few people who write software for those iOS gadgets. Kiss your "professional" Mac equipment goodbye, because it has lost all relevance for this "new" media corporation. I’d rather just give HBO $10/mo. directly in order to support their programming. Apple always wants such a ridiculous percentage of profits for doing basically nothing. This doesn't make any sense for HBO. I subscribe to HBO's $15/mo. service, and if I can get the same thing for $10/mo. through Apple, I'm going there. Why would they go 100% of $15/mo./subscriber to a percentage of $10/mo./subscriber? I'd imagine there's a few people in the boat with me on the math. What we need is an à la carte service based on number of shows. For example, $10/month can access 10 different shows regardless of network (though I'm sure tiers would be needed). I have zero interest in 99% of what I have available to me through conventional subscription services.